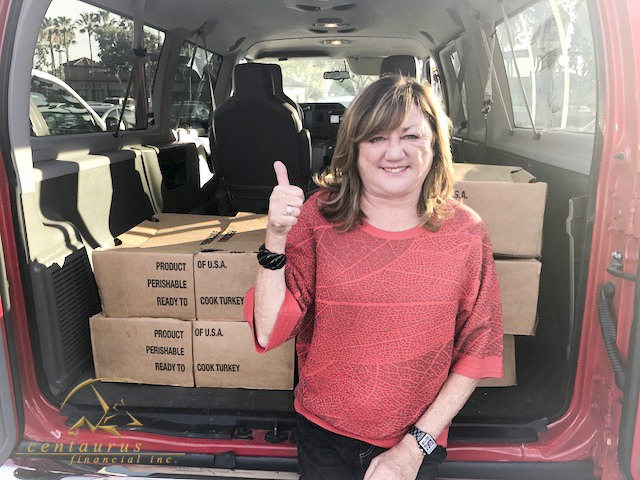 November 20, 2017, Anaheim, California – Today, Centaurus Financial, Inc. and its generous employees donated 32 turkeys and over $4,000 in grocery gift cards to the Orange County Rescue Mission. The Orange County Rescue Mission is a faith-based non-profit outreach program that includes food assistance and housing to homeless families and individuals at its Village of Hope in Tustin, California. On Thursday, the Orange County Rescue Mission will be hosting their 52nd Annual Thanksgiving Dinner and anticipate feeding more than 660 homeless families and individuals. After learning about the anticipated food shortage the Mission was experiencing, the Centaurus team rallied to help. Employees were given the option to donate their annual Thanksgiving grocery gift cards to the Mission with Centaurus agreeing to match their donations and purchase turkeys. The result was overwhelming. Headquartered in Anaheim, California, Centaurus Financial, Inc. is a national independent broker/dealer licensed to offer securities, investment advisory services and insurance products. Centaurus is a member of both the Financial Industry Regulatory Authority (FINRA) and the Securities Investor Protection Corporation (SIPC) and a Registered Investment Adviser with the Securities & Exchange Commission (SEC). For more information about Centaurus, please visit www.centaurusfinancial.com.